It’s just another normal day at the office as a social media manager. You start replying to Tweets, scheduling a few Facebook posts and put up a couple pictures of last night’s company dinner on Instagram. Then one of your executives comes to you and says “I need you to pull a report of our Instagram progress for the past three months.” You say sure, no problem. But once she leaves, you sit thinking to yourself, what in the world should I put in this report? If that scenario sounds familiar, you’re not alone. With social media sites like Facebook, Twitter and even Pinterest, you have plenty of metrics to measure the success of your campaigns. But with Instagram, it’s not as simple. Although the company is taking steps to make the app more marketer friendly, it’s not all the way there yet. Thankfully there are some Instagram metrics you can (and should) track to measure your efforts. The first metric most brands look at to measure social media engagement on Instagram is the number of likes for their photos. Likes are nice, but comments are an even stronger indicator of engagement. Think about it. It takes more time to think out and write a comment than it does to like a photo. 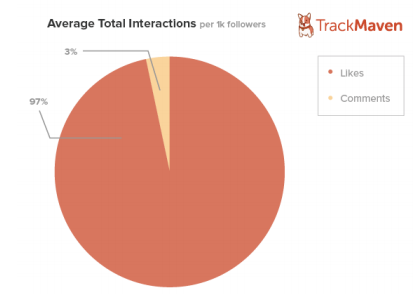 TrackMaven found brands average 18.54 likes per photo per 1,000 followers, but just 0.63 comments. If your average number of comments per post starts to increase, it could mean you’re building a community and a loyal following, which is a big goal for most companies. On the flip side, if you notice you’re barely getting any comments or the number of comments you’re getting per post is declining, it could be a sign that your followers aren’t connecting with your content. Don’t put up the white flag just yet. Use it as an opportunity to go back to the drawing board and think of ways to create better photos and boost your engagement. Try adding videos instead of just pictures, or get more creative with your Instagram captions. Hashtags and Instagram go together like peanut butter and jelly. Not only do Instagram posts with hashtags get more engagement, but hashtags also make your posts more discoverable. There are a few different Instagram metrics you can track when it comes to hashtags, but measuring which hashtags are getting the most engagement is your best bet. Since Instagram is one of the few social media platforms that encourages the use of multiple hashtags in your posts, you should start putting together a list of the ones that get the most likes and comments. That way you can add them into relevant posts as often as you need to. Remember, hashtags on Instagram function like keywords for search engine optimization. The hashtags with the most engagement are like your keywords that bring in the most traffic. Learn what those are, and you’ll have a lot more success. Another overlooked benefit of this metric is that it gives you an idea of what type of content you should post. 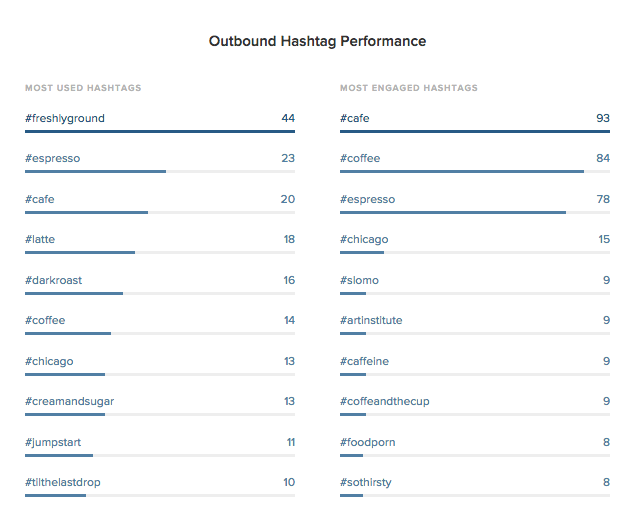 For instance, in the screenshot above we see that #cafe, #coffee and #espresso received a lot more engagement than the other hashtags. As a cafe, this tells you that you should post more pictures inside the coffee shop, or pictures of drinks. You can never go wrong with the classic coffee art photo. If you find that your posts aren’t getting the amount of engagement you’d like, look over this metric. The problem could be your hashtags. Looking at companies like Nike and Starbucks that get thousands of likes and comments on each post can be very overwhelming if your photos and videos only average a couple hundred likes. But there’s one thing you’re forgetting. Nike and Starbucks have millions of followers, so their posts have more reach. 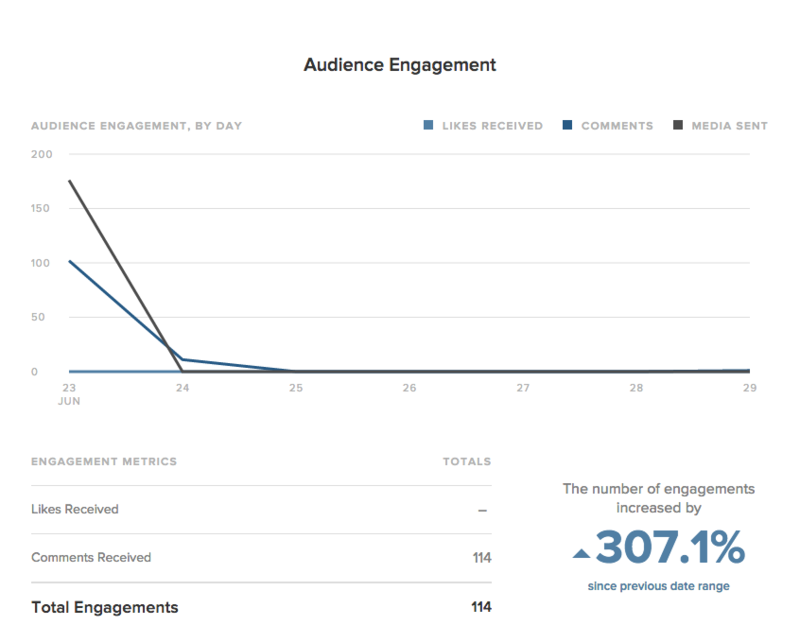 The engagements per follower metric is perfect because it shows you how many likes and comments your posts are getting per individual follower. This way, you don’t get wrapped up in comparing your company’s numbers with larger brands. It’s possible for a smaller page to get more engagements per follower than larger ones, even if they have less engagement overall. In order to boost this number, you can try posting more exciting content so that people look forward to checking out your page every day. For instance, photographer Joel Strong takes pictures throughout New York and uses replacement heads of celebrities and famous characters. Followers can’t wait to see what’s going to be posted next, so they constantly come back. Another good idea is to upload new content on a regular basis. Aim for at least one or two new posts each day. What this metric tells you: The total reach of your posts. Ideally, the number of followers you have will grow over time as you build your brand. Whether it’s through shoutouts from influencers, word of mouth between friends or even paid ads, you want to grow your audience for social proof and to be able to reach more people. When you look at this metric, measure it over a period of time. Tracking it day by day isn’t going to give you the information you need in order to make informed decisions. For example, if you notice that you’re only earning a handful of new followers each month, you need to ramp up your marketing efforts. 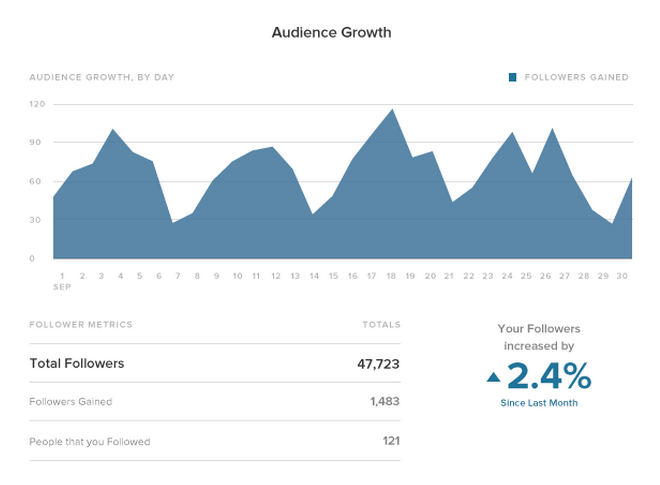 On the other hand, if you see the number of followers you gained one month and noticed a huge spike on one specific day, then you should look into what you did to achieve that growth so you can replicate it. Some marketers look at your number of followers as a vanity metric, and in some ways it can be. However, the real benefit of measuring your follower count is to know what your brand’s potential reach is for the content you’re publishing. Pages with more followers have more reach. The fewer people that see your posts, the less engagement you’re going to get. Getting more followers gives you a better opportunity to get your content seen. What this metric tells you: How much traffic your website receives from Instagram. One of the biggest complaints businesses have about social media marketing is not being able to track the return on investment (ROI). Although we know that it’s possible to track social media ROI, Instagram threw marketers for a loop because the app doesn’t allow clickable links within posts. So what do you do if you want to promote a new piece of content or a special on Instagram, and be able to easily track the results? Use UTM parameters of course. UTM parameters are tags that you can add onto a URL to give Google Analytics more information about the link. By adding UTM parameters to the links you share on Instagram, you can accurately track your campaigns and credit traffic that comes directly from Instagram. Here’s a complete guide on how to setup UTM parameters for your social media. Since the URL’s will be a bit long, it’s a good idea to use a URL shortener like Bitly when you’re including links in your captions. That way, people can open up their browser and type in the URL. Another option that’s more convenient than adding URLs inside captions is to use your bio. Instagram allows you to have one clickable link in your profile section. Some brands like to use this link to promote special deals or new content. Whenever you have something new to promote, it’s as simple as changing the link. Or, you can go the route of Apartment Therapy. The apartment design website shares photos of design inspiration on their Instagram page. They create a corresponding page on their website (linked in their bio) where people can go to get more information on the design. For example, take a look at this post. Notice the call to action to click the link in their bio. That link, which is tracked, directs you to a page with all the images from their Instagram profile. You can see the corresponding image for the post above. What these metrics tells you: How popular your Instagram Stories are. With Instagram Stories now becoming a significant feature, more brands have jumped on board to test it out. But how do you know if what you’re doing is actually working? Unique views: This is the number of people that saw your story. You can also see the number of people that saw each individual slide in your Story. Completion rate: Your completion rate shows you how many people view your full story. This isn’t a metric Instagram gives you, so you’ll have to do some math. Don’t worry, it’s simple. You’re going to divide the number of people that saw your last story by the number that saw your first one. Then multiply by 100. Direct messages to your story: The number of people who send your brand a direct message from your Story. Right now, this is the closest thing you have to an engagement metric for Instagram Stories since users can’t Like or share them. If you want to get a make-shift engagement rate, divide the number of DMs from your Story by the number of views. Also keep in mind that you won’t have historical data on your Stories within the app. So if you want to track your performance over time, you’ll have to do it manually through a spreadsheet or elsewhere. 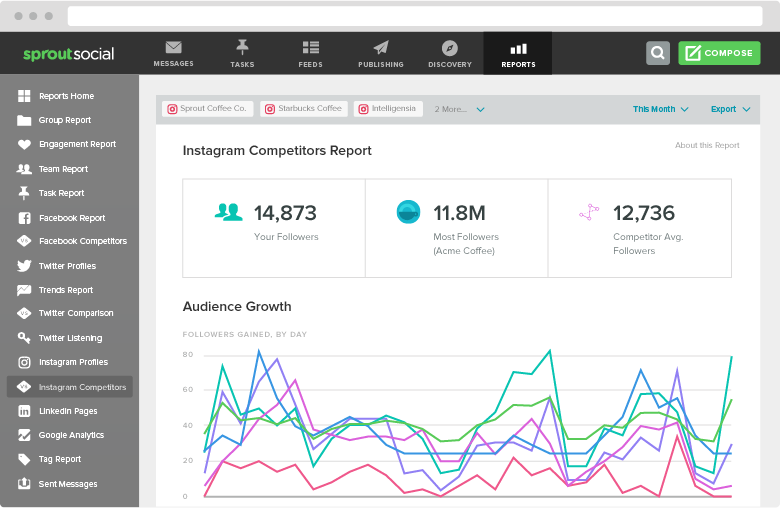 With Sprout’s Instagram Competitors Report, you can not only see important metrics for your brand, but your competitors as well. Get a leg up on the competition by measuring their statistics. The thought of dealing with metrics, data and social media analytics might not seem like the most exciting thing in the world at first, but don’t get discouraged. As your Instagram account grows, you’ll start to look forward to checking your numbers and watching the progress. Plus, with Sprout Social’s spiffy Instagram reports, you won’t have to worry about being totally confused by data, which is a huge bonus. The only way to make improvements and move forward is to know where you started, and where you currently stand. Tracking these six Instagram metrics will make it easier for you to see what’s working for your business and make the right moves to help you grow. What Instagram metrics do you track? Leave a comment and let us know!